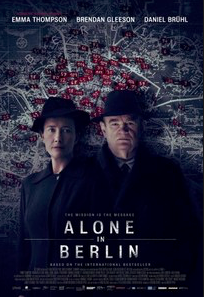 This entry was posted in Movie, War Movie, WWII and tagged Alone in Berlin, Brendan Gleeson, Danile Brühl, Emma Thompson, German Resistance, Hans fall ada, Movies based on books, War Movie, WWII. Too bad. I just watched I Tonya and loved it. It is too bad. Really didn’t live up to my expectations. I hate those fake accents. I don’t know why film directors do that. It’s painful to listen too. And mostly ridiculous. Check out. (To END ALL wars) the true story of the K w a I. . Ballads. O. Soldatum. (Ballad of a Soldier) Japan’s war,original. Color photos,& movies ,JAPAN from ww2,& before. The fog. Of war,macnamara,napalm., ww2 ,& v.nam( bombed more than germany,& JAPAN both put together. Alle ist stille. U n s d e m western. From ten (ww1) Erich Maria. Remarque. A time to live ,& a time to die. All so by ERICH MARIAA REMARQUE. READ THE BOOK. ( A HIGHER CALLING) NOT ALL JAPANESE , NOR GERMANS WERE BAD AS HISTORY DESCRIBES THEM. ALL MUST GET ALONG WITH EACH OTHER!! OTHERWISE MAN KIND IS DOOMED,THEN YOU SEE ,IT ULTIMATLY ,MATTERS NOT WHO IS MORE WRONG ,OR RIGHT,WELL ALL LIVE IN PERIL AT THAT MOMENT, CONTINUE TO PRAY FOR A PEACFULL WORLD,AND KEEP PEACE IN THAT HEART OF YOURS,MY BROTHERS,& SISTERS!! ALAS!! AND AMEN TO YOU ALL. I have reviewed both Ballad of a Soldier and All Quiet on the Western Front. Great movies, I agree. I certainly do hope for a peaceful world.